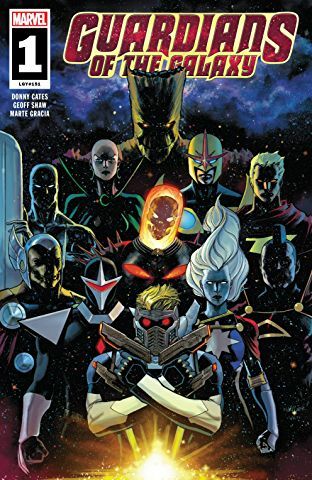 As you might predict, from such clues as this being the launch of a new series and other clues like Marvel’s solicitations, this issue is the story of how the new team comes together. I have two relevant pet peeves (among many pet peeves, but only two related to this issue) – issue-number-ones that are all setup and basically nothing of the new team (see the recently relaunched Fantastic Four #1) and all-black pages that count toward the page count of the story I’m paying for (see the recent death of Matt Murdock in Daredevil). This issue managed to check both of those pet peeve boxes but did so in a way that un-peeved me! I don’t know anything about Donny Cates, but he so far has tapped into precisely the spirit I loved about the 00s Abnett y Lanning series. And I don’t know anything about Geoff Shaw, but his art captures the same fun-action vibe of Paul Pelletier, who I consider the definitive Guardians of the Galaxy 00s artist (even though I wasn’t around for the whole ride). 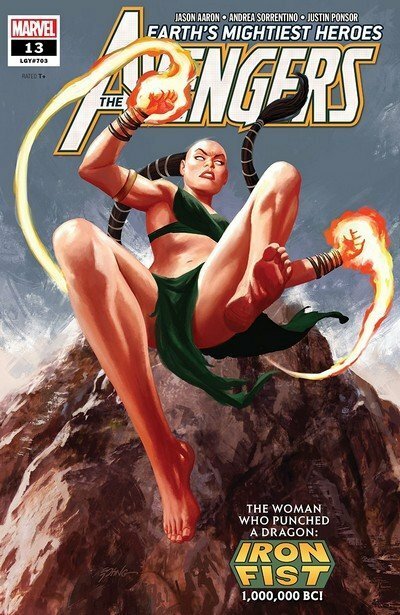 But speaking of headless bodies, that leads me to Avengers #13, the story of the first Iron Fist from 1,000,000 B.C. exactly. One of my least favorite comics ever was Jason Aaron’s take on Fat Cobra. Granted, Fat Cobra and the first Iron Fist are profoundly different characters, but I was glad to see that Aaron has matured beyond the point of calling out the kung-fu moves as opportunities for humor. It was also pretty gross. Lots of exploding heads with suspended teeth floating in the air where the skulls used to be. But hey, that’s life on the prairie I guess. But on its own, I did very much enjoy it, and as a series, I’ve noted before that I’m intrigued by this fragmented build to whatever Aaron is leading to, but it’s getting so disjointed now that this just straight-up felt like a filler issue, or maybe one that should’ve run a few months ago? Because we ended last issue with Blade’s surprise appearance, and next issue is some battle with vampires. I can’t say that a random detour to one million years B.C. (exactly) is optimizing my sense of Being Along for the Ride. Though speaking of standalone retcons, that leads me to Uncanny X-Men Annual #1. As people who buy comics know, annuals are a crapshoot. Frequently they’re complete wastes of time, paper and especially money. But sometimes they’re great! I feel like the latter must be less frequent because I always get excited when it happens. But I enjoyed the heck out of this story. Oh! And another thing—I hate Cyclops! I’ve hated Cyclops for more than a decade! I named Cyclops worst hero of the year for three years in a row! In fairness, I probably would’ve called him worst hero for more years if our blog hadn’t fallen off the face of the earth sometime in 2010. 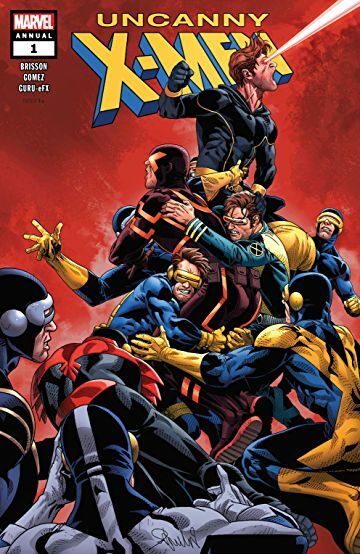 But this was a great story that connects the Extermination miniseries and the current Uncanny X-Men series while taking care to truly explain how Cyclops returned with attention paid to continuity! That’s checking all my boxes, and it manages to do so in a way that redeems the character. Cyclops became so unbearable in the mid-to-late 00s because the humility and self-doubt that made the character so likeable and relatable were just completely gone. This issue could’ve easily aimed for “reset” but it instead aspired for “redemption” and nailed it. I also really enjoyed Carlos Gomez’s art in this issue, so I’m a little bummed that Salvador Larroca, who haunted various X-Men titles from 1997 to 2007, is returning (though Fin Fang Doom is probably excited, if anyone knows where he is). I was a Larroca fan once a long time ago, but at some point around a decade ago, Marvel stopped inking the guy and just cranking up contrast on his pencils. Fingers crossed that they get someone to ink his lines. Speaking of those whose reception is impacted by the presence or lack of chemical substances like “ink” and “hallucinogens,” that leads me to Batman #63. I mentioned last issue that Tom King could write pretty much anything and I’d give him the benefit of the doubt. This tested that theory a little bit, but for reasons it’s hard to blame King for. Then this issue was a whole lot of talking to people that we learn aren’t actually there—Constantine, Catwoman—as Batman understands he’s experiencing Scarecrow-induced visions. And it turns out this has been going on for a little while (this is the third issue of this arc, to be precise). My first thought was “Ooh! 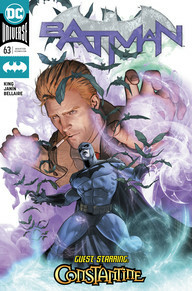 I want to go back and re-read the past few issues with this new information!” My second thought was “Ehh, I kind of feel like we’ve been here before.” I have recently revisited Batman RIP, Final Crisis and Court of Owls, and all of those had elements of “Oh, this thing that Batman is experiencing isn’t actually real.” I also just endured Death of Daredevil, which was all in Daredevil’s head. I have no doubt that King will do a good job with this and have a good reason for taking us this direction, but I can’t help but feeling tired of this technique. Speaking of lack of clear vision, that leads me to Superior Spider-Man #2. I’ve been able to go back and talk myself into thinking this issue wasn’t as bad as I initially thought it was, but this issue was such a letdown after a grand debut. In general, I have no issues with a scenario designed to humble Dr. Octopus, but the execution was just so strange. Here Terrax the Kirby Reject arrives on earth, and Superior Spider-Man takes him on to save San Francisco. So far, not a terrible idea. 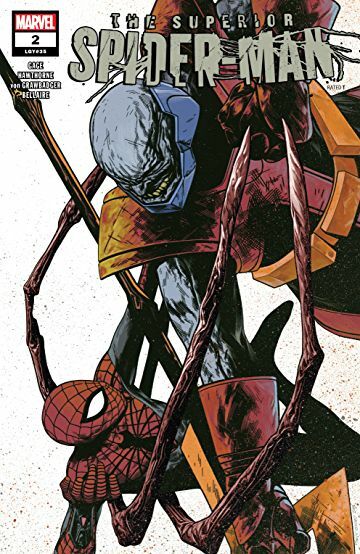 But if we accept my premise that we needed a scenario to show the limits of Superior Spider-Man—a scenario that truly puts him in peril—then fine, that’s one thing, but then why would Christos Gage proceed to undermine the gravity of the situation with painfully unfunny attempts at humor with the Night Shift mercenary squad? This story feels like a series that has lost its way; this issue might have been more forgivable if we were on issue #27 or #43 or something, but this is the second issue of the series!. That’s concerning. All of a sudden, this feels like a series that maybe got an editor to accidentally sign its permission slip and figures it’s not worth trying too hard because it’s just a matter of time before it gets caught. What makes this series interesting is the relationship between Dr. Octopus and Anna Maria Marconi and the intersection of their personalities; that’s still there, and I think a course correction should be relatively easy, but pivoting toward cosmic powers and intergalactic invaders in the second issue is just weird.